The Old Dairy at Bedborough Farm Cottages in near Wimborne, Dorset sleeps 5 people. Bedborough Farm Cottages near Wimborne is in a semi-rural location, adjacent to horse stables and accessed along a track; these two semi-detached, beautifully refurbished, single-storey barn conversions, The Parlour (ref UKC1308 [Barley Edge]) and The Old Dairy (ref UKC3109) offer tastefully presented and comfortable holiday accommodation. Ideal for couples or families, each property has a light and spacious open plan living/dining room/kitchen, with a wood burner and folding doors which lead out to an enclosed part patio/part lawned garden with sitting-out area, garden furniture, Wendy house for the kids, barbecue and hot tub! Each property offers a well-equipped kitchen, two bedrooms and two bathrooms as well as an additional z-bed for a child. There is a games room with table football, table tennis, magnetic darts and a bar area. For guests who would like to bring their horse, stabling can be arranged by prior arrangement with the owner. This area is known for its scenic walks and wildlife, there is a direct gravel track along the Castleman Trailway (the old railway line) to miles of woodland walks making this ideal for walkers and cyclists. One route leads to a pub, Chinese restaurant and golf course (all within 20-minute flat walk), Cranborne Chase and the beautiful Jurassic coastline (Purbecks, Swanage and Wareham) is within easy reach, and is a nationally protected Area of Outstanding Natural Beauty and offers extensive scenic walks and a wealth of wildlife. There is so much to do in the area for all ages and whatever time of the year. Wimborne is a quaint market town with a historic town trail taking in the buildings ranging from the 15th to 17th centuries. Here you will also find the popular Tivoli theatre, model town, coffee houses, shops, market and restaurants. The sandy beaches at Bournemouth and Poole are just 10 miles away and Sandbanks, Studland Bay and the Poole Natural Reserve are within easy reach. National Trust properties (refs UKC3109, UKC3108 [The Parlour]) Kingston Lacy Estate, Badbury Rings and Brownsea Island are a short distance away. Moors Valley is a popular place to visit and has scenic walks and is excellent for wildlife spotting. There is a range of activities in the area including fishing, cycle hire, golf and Go-Ape Tree Top Adventure. The New Forest National Park is easily accessible, and provides miles of scenic walks and a network of bridle paths and footpaths, and the ponies and cattle roam the streets in the picturesque villages. The properties are conveniently placed for road links to the cathedral cities of Winchester and Salisbury, Christchurch harbour and the iconic Stonehenge. The beach is 10 miles from Bedborough Farm Cottages near Wimborne. With the shop, pub and restaurant 1½ miles from Bedborough Farm Cottages. The properties can be booked together to sleep up to 10 people. The Old Dairy is all on the ground floor. 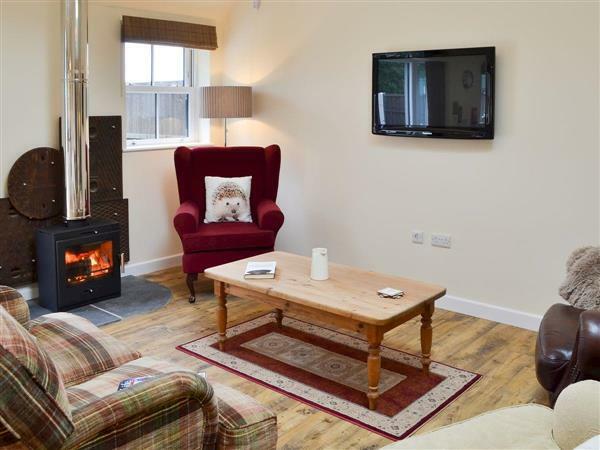 Living area: With wood burner, Freesat TV, DVD player and patio doors leading to patio. Kitchen area: With electric oven, electric hob, microwave, fridge/freezer, freezer, dishwasher and washing machine. Bedroom 1: With king-size bed, Freesat TV and 10 steps to en-suite with bath, shower cubicle and toilet. Bedroom 2: With twin beds, z-bed (for child), Freesat TV, DVD player and step to en-suite with shower cubicle and toilet. Both properties: Calor gas underfloor central heating, electricity, bed linen, towels and Wi-Fi included. Initial logs for wood burner included. Cot and highchair available on request. Welcome pack. External games room with table football, table tennis, magnetic darts and a bar area (shared with other property on-site). Enclosed lawned garden with patio, garden furniture and barbecue. Hot tub for 5 (private). Stabling and grazing for horses available on request. Bike store (shared). Private parking for 2 cars. No smoking. Holidays at The Old Dairy, Bedborough Farm Cottages run from Friday to Friday. Pets allowed at Bedborough Farm Cottages - The Old Dairy. For a better idea of where Bedborough Farm Cottages - The Old Dairy is, you can see Bedborough Farm Cottages - The Old Dairy on the map below. Bedborough Farm Cottages - The Old Dairy is in Dorset; should you be on the lookout for a special offer, you can find all the special offers in Dorset. It's always worth checking to see what is on offer at the moment. Do you want to holiday near Bedborough Farm Cottages - The Old Dairy (UKC3109), you can see other cottages within 25 miles of Bedborough Farm Cottages - The Old Dairy; have a look to find your perfect holiday location.